Indeed, there was method to her madness. Today, Chef Haselkorn is the program manager and chef instructor at Healthy Waltham, a small, but ambitious, nonprofit that promotes healthy lifestyles for families and underserved populations in Waltham. 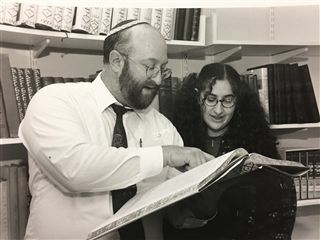 She’s also one of the organizers of this year’s Boston’s Jewish Food Conference, which Gann is hosting on March 26. On any given day, Haselkorn may be teaching students in an elementary school about nutrition and handing out samples of her healthy recipes; making nutrient-packed nibbles with children at a low-income housing development; or conducting a cooking class in Spanish with a new moms support group. 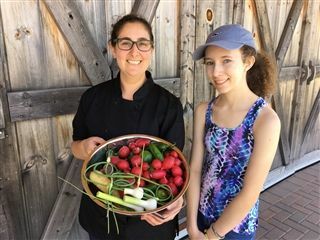 She may also be found teaching seniors how to cook simple, healthful meals or leading hands-on cooking programs for adolescents and adults with intellectual and developmental disabilities. Haselkorn says her years at Gann were incredibly transformative, especially because she and her classmates —only 48 in Gann’s first year— helped shape the future of the school. “My time at Gann taught me how to engage respectfully with people from different backgrounds who vehemently disagree with me, to find common ground, and to create something greater and more beautiful than we could on our own.” Her interest in social justice was also nurtured at Gann, she adds. Haselkorn advocated for Gann to be the site of the sixth annual gathering, which will feature a huge array of workshops on cooking and food justice —ranging from forging farm-to-school partnerships to the kosher ritual slaughter of a chicken to creating healthy food pantries. Chef Ari Kendall, a 2007 Gann alumnus, will teach how to prepare shakshuka, a Middle Eastern dish of poached eggs in spicy tomato sauce. Haselkorn says she looks forward to bringing together her various connections and networks around food, social justice and Waltham — past, present and future — at this year’s conference at Gann.